Right then, that's it for a bumper day of football updates as we covered the news conferences for this weekend's Premier League and FA Cup games...not to mention the small matter of the quarter-final draws of the Champions League and Europa League. 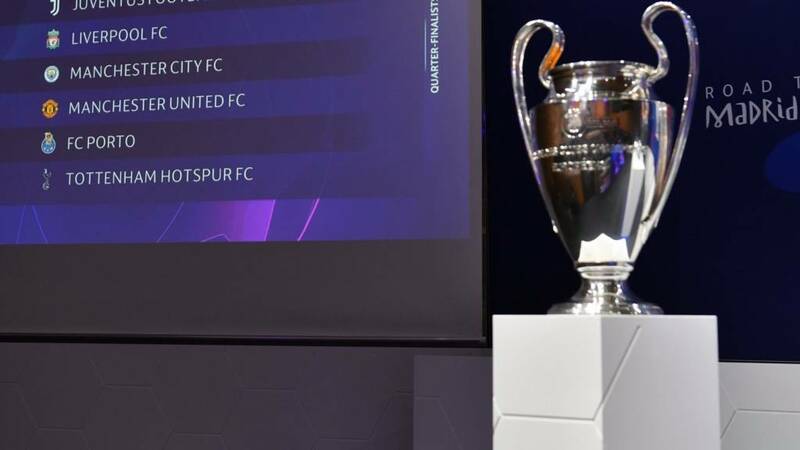 Tottenham were drawn against Manchester City while Liverpool face Porto and Manchester United must take on Barcelona. As for the Europa League, Arsenal and Chelsea were kept apart and cannot meet until the final. Thanks for joining us and getting involved. Here's more on today's European excitement, plus a look ahead to this weekend's domestic fixtures, on which we'll have live text commentary for you from Saturday. Now go get those days off booked! And finally from Brighton boss Chris Hughton before the Seagulls visit Championship Millwall for a place in the FA Cup semi-finals: "I went to see them on Wednesday evening - they're a good and physical side. "We'll start as favourites, but they're the home team on the back of a scalp in the previous round. I don't see this game as being any easier than last weekend (2-1 win at Palace). "The excitement at this stage of the competition is normal. It means a lot to the supporters - to have the possibility to be in the last four is always tough when you get to this stage. "It's an open competition now." Back to the FA Cup quarter-finals and Brighton boss Chris Hughton has said that Florin Andone and Pascal Gross will be out for the game against Millwall, but Leon Balogun is back and available for the Seagulls. Newcastle go into the game six points clear of the relegation zone, just three points behind 12th-placed Bournemouth, after winning three of their last four games. Boss Rafael Benitez added: "We are doing well and fine. It’s a game that can change a lot of things. If we win this, we can push on without fear. If we don’t win, we must keep on fighting." On whether they are safe in the Premier League: "We have to be careful. The job is not done. Every game is a cup final for us. On our day we can compete with anyone. "Too many teams are still around [the relegation zone]. If you play anyone from the top six twice in a row you may be back in a relegation battle." On a points target: "I think 38 will be enough. After that, we can go for 40." Newcastle boss Rafael Benitez has some big injury news earlier, with captain Jamaal Lascelles missing the trip to Bournemouth. Sean Longstaff and Rob Elliot and are also sidelined but Ciaran Clark is available. It is a maximum of five qualifiers, Guy. The team that finishes fourth would only transfer to the Europa League if BOTH the Champions League and Europa League winners finish outside the top four. Everton goalkeeper Jordan Pickford faced some criticism after last week's 3-2 defeat at Newcastle. Boss Marco Silva on the England keeper: "I don’t like to go particularly on one player. It’s not fair. "My players are always behind me. I’m the first one to take responsibilities for my players on the pitch. “It’s a matter of collective behaviour. I understand what people are saying about Jordan. “Jordan has all my confidence, like my other goalkeepers. He has the confidence of the national team coach also. We are here to get him better every day. “In some moments everybody is happy with you, in other moments people speak not so good things about you. “It’s normal in football. They are the same people who, eight, nine, 10 months ago were celebrating the good performances from Jordan. Everton claimed a 0-0 draw in the reverse fixture in November. Manager Marco Silva said: “There was good intensity in the game, good counter attacks also. “It’s everything we should do next Sunday. They are really strong in that front line, and in the middle zone also. But they are here playing at Goodison. On playing at Goodison Park: “If they can repeat [the derby atmosphere] we will be delighted by that. “The last game against Newcastle was really tough to them. They didn’t deserve that defeat. Earlier this week, Everton manager Marco Silva was charged by the FA with "improper conduct" after he argued with the match officials following his side's 3-2 defeat at Newcastle. “I didn’t receive the letter, the answer, yet," Silva has said today. “What they say to me, I’m here to accept and respect. Ekene: I fancy an Arsenal Vs Chelsea Final in the Europa League and Barcelona Vs Man City Final in the Champions League. Ballfoot: It’s going to be a Chelsea vs Napoli final. That could be the making or breaking of Sarri at Chelsea, he’ll either be sacked in the morning or stay there for another 3 years. Gregory: In the previous two rounds, Arsenal made a mess of things in the first leg against "lesser" competition. Perhaps Napoli will bring out the best from the Gunners straight away. It would be very Spursy to make it to the CL final, lose, finish 4th above Arsenal and Arsenal to win EL. Manchester City boss Pep Guardiola has confirmed skipper Vincent Kompany will miss the FA Cup quarter-final at Swansea. Guardiola says Kompany complained of an injury before the Champions League win over Schalke in midweek and has not recovered. Kevin de Bruyne is also missing, as is John Stones, who has returned to training. Pep Guardiola really did not want to talk about the swirl of allegations surrounding Manchester City at the moment. What he was willing to say - through gritted teeth - is that he has full confidence in his squad to deal with any transfer ban that may come City's way. But more than that, Guardiola really doesn't want to say. "I answered five questions last week, I cannot be the right guy," said the City boss. "I’m concerned with my job, what will happen will happen." Manchester City boss Pep Guardiola did not have much to say about the allegations of potential action by Fifa over how the club has recruited young players. It has been claimed a two-window transfer ban is imminent. Guardiola is getting weary of being asked similar questions: "I cannot say every conference. I was clear. The club made a statement." Right, now that the draw for the quarter-finals and semi-finals is done and dusted, who has the best chance of lifting the Champions League trophy on 1 June? Take a look at the remaining sides here and click on the arrow next to the team you think will win the competition. Most people will have Manchester City as heavy favourites to beat Tottenham in the Champions League quarter-finals. However, something to bear in mind. If the Premier League matches over the last 10 seasons had been played over two legs, City would have won five and Tottenham four. City have won the last three games between the pair - but Tottenham did not lose any of the previous four. Kithmina: Everything set up for a Manchester Derby in the Champions League final! Matt Stokes: imagine a City v Liverpool final. city beat them to champions league and Premier league. How’d you recover from that!